Principal Commanders: [C] Lt. Gen. Jubal Early, Maj. Gen. Robert E. Rodes [U] Maj. Gen. Horatio Wright, Brig. Gen. George Crook, Col. Joseph Thoburn. Forces Engaged: [C] Three infantry divisions under Gordon, Wharton, and Rodes, about 8,000, and at least 3 batteries;[U] Three infantry brigades of Crook's Corps (about 3,250 men), supported by batteries and a division of the VI Corps, about 5,000 engaged. Significance: In the first weeks of July 1864, Lt. Gen. Jubal A. Early raided Maryland with an army of about 14,000 men, defeated a US force at the battle of Monocacy (9 July), and marched on Washington D.C. 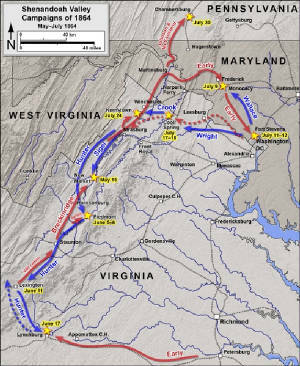 Confronted there on 12 July by US veterans diverted from the Army of the Potomac, Early retreated, crossing the Potomac River at White's Ferry and the Blue Ridge at Snickers Gap. Elements of three US corps (about 25,000 men) under overall command of Maj. Gen. Horatio Wright pursued and met Early's rear guard at the Shenandoah River crossing of Snickers Ferry near the farm of Cool Spring. 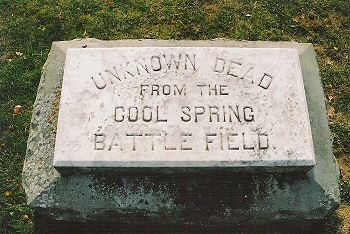 Although brief in duration, the battle of Cool Spring was desperately fought, checking US pursuit for several days. 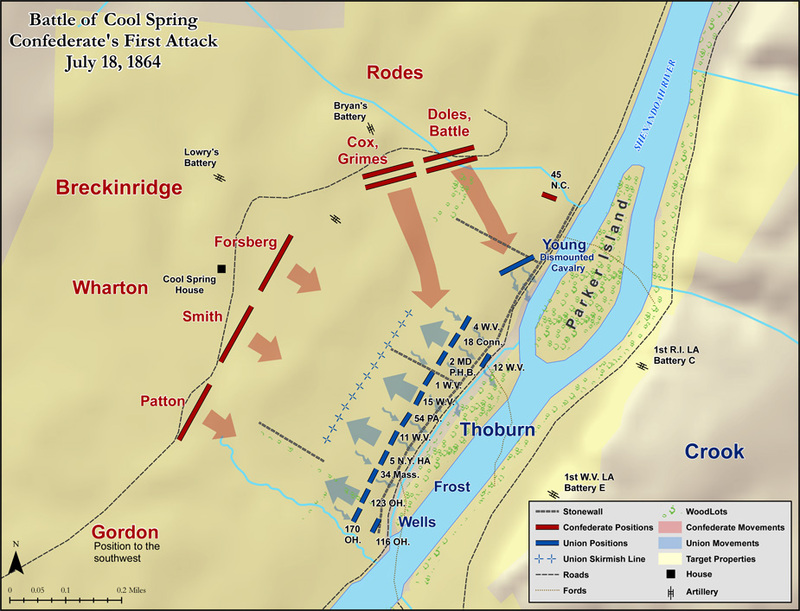 The battle of Cool Spring (also known as Snickers Ferry or Parker's Ford) is representative of the division-sized engagements that occurred almost weekly throughout the remainder of the 1864 Valley Campaign, including Rutherford's Farm (20 July), Guard Hill (16 August), Abrams Creek (17 August), Cameron's Depot and Summit Point (21 August), Smithfield Crossing (29 August), and Berryville (3-4 September). These encounters led up to the decisive battle of Opequon (Third Winchester) on 19 September. Skirmishing at Snickers Ford (17 July): On the afternoon of 17 July 1864, the US cavalry division of Alfred Duffi‚ reached Snickers Ford and attempted to force a crossing of the Shenandoah River. Two regiments of CS infantry supported by two pieces of artillery positioned on North Hill overlooking the ford repulsed the attempt. US cavalry then tried to cross at Shepherd's Ford about two miles south but were repulsed by CS cavalry of Vaughn's brigade. During the night, Duffi‚ continued south along the river, leaving a smaller force to picket the fords. On the morning of 18 July, US cavalry pickets, supported by Mulligan's brigade of infantry (Crook's corps) again attempted a crossing at Snickers Ford but were repulsed. Advance of US Infantry (18 July): Col. Thoburn's division of Crook's Corps, followed by the VI Corps arrived on the Berryville Pike (current rte. 7) from their bivouac near Purcellville. Union generals Wright, Emory, and Crook conferred on River Hill, where they established a signal station and brought up a battery of artillery. It was assumed that General Early's CS army was in retreat to Winchester and that the ford was defended only by cavalry. Because the attempted crossing at Snickers Ford in the morning had been unsuccessful, the US commanders decided to cross a division one mile downstream. The infantry diverged from the main road onto a rocky cart road that led to Judge Parker's house, mill, and ford. The intervening hills disguised the movement from the CS pickets on the west bank of the river. River Crossing (18 July): About 1500 hours, Thoburn's 3,250 infantrymen forced CS skirmishers back from Parker's Ford and crossed the shallow river at a number of places across and between the islands. Once on the west bank, US skirmishers fanned out across the Cool Spring farm, while the main body deployed along a rise about 100 yards from the river in the midst of a large wheatfield. Commands regrouped after the crossing and prepared to move south to uncover Snickers Ford. Captured Confederates, however, revealed that the island fords had been defended by infantry and that Early's army was nearby. Thoburn alerted his superiors on River Hill (by signal flag and courier) and awaited further instructions. He was told that he would be supported by a division of the VI Corps, which had begun to arrive on the east bank near the Parker House. CS Response (18 July): In response to Thoburn's crossing (or in anticipation of it) Maj. Gen. John B. Gordon's division advanced along the Berryville Pike from its bivouac at Webbtown. Gordon deployed along the river bluffs north and south of North Hill. Simultaneously, Brig. Gen. Gabriel Wharton's division moved toward Cool Spring from its bivouac near Wickliffe Church. Wharton deployed in line of battle and advanced on Cool Spring forcing back the US skirmishers to their main line near the river. Maj. Gen. Robert E. Rodes's division was farther north at Gaylord but was set in motion to come up on the left of Wharton. Skirmishing extended along Wharton's and Gordon's fronts. 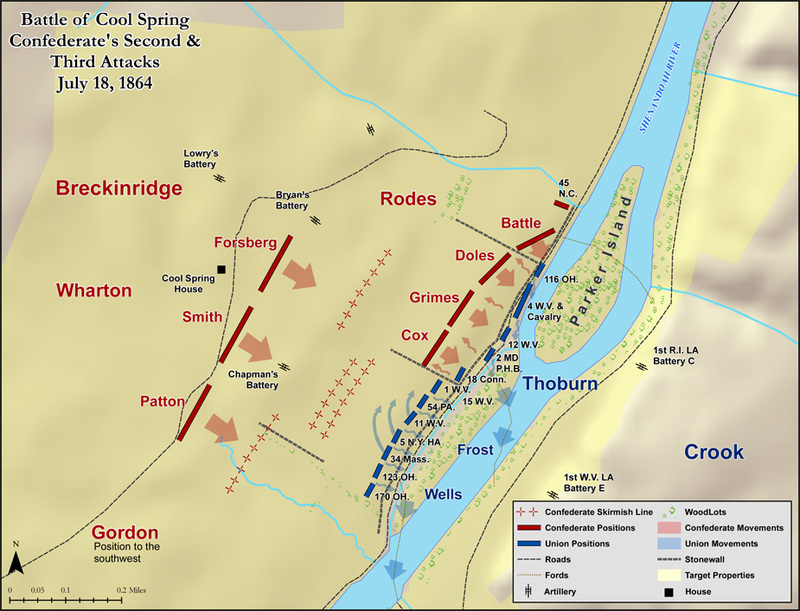 Rodes's Flank Attack (18 July): Colonel Thoburn was now aware of his precarious position but hoped to hold out until reinforced or withdrawn after dark. Rodes's division arrived from Wickliffe Church, moving through ravines and behind the grove at Westwood which concealed the movement of the troops until they were within striking distance of Thoburn's contracted line. Rodes deployed to Wharton's left, his line bending in an arc almost at right angles to the river and the US right flank. About 1800 hours Rodes threw his division forward on a compact front, surprising and crushing the US right. Thoburn sent the 116th Ohio to reinforce his right as both sides struggled for possession of a stone fence that bisected the wheatfield. A second CS attack drove US forces back to another stone fence along the river bank. There, they held out against a third desperate CS attack that came near to driving them into the river. Three batteries of Union artillery came into play from the heights on the east bank. A division of the VI Corps deployed on the east bank and engaged in sharpshooting, but it was not sent across the river. Three batteries of CS artillery supported Rodes's attack. Colonel Owens, commanding a CS brigade was mortally wounded. The bulk of the almost 850 casualties of the battle occurred at this time and littered the wheatfield. US Withdrawal (18 July): The Union line held out until dark, then began to recross the river unmolested by CS infantry. An artillery duel broke out across the river. US and CS batteries fired at each others' positions, guided by the flashes of discharge and explosion. When US infantry was safely on the east bank, the artillery fire tapered off, ending about 2100 hours. Later CS skirmishers advanced to the river, finding the Union line abandoned. CS units spread out across the field to tend to the wounded of both sides. General Crook was angered that Thoburn's command had been left to their own devices without being reinforced by the VI Corps, which was at hand. Aftermath: The battle was a Confederate victory. Wright had sent a small force against a well reinforced Confederate position without the aid of cavalry because he mistakenly assumed it was only the pickets of Early's rearguard. Thoburn's force paid dearly for the mistake. Still, Thoburn's judicious use of terrain and lack of coordination on the Confederate side allowed Thoburn to stave off a full routing of his troops and thus was able to minimize his casualties. The following day: both armies remained in the same positions as the night before and engaged in little fighting. Gen. Hunter, however, took the initiative and sent a force out from Harpers Ferry to pressure Early's left from the north. See also: Battle of Cool Spring, Virginia and Shenandoah Valley Campaigns: The Civil War Battles. Try the Search Engine for Related Studies: Battle of Cool Spring Civil War Virginia History Results Battlefield Map Shenandoah Valley Picture Photograph Results Summary Reports Records Maps Island Ford, Parkers Ford, Snickers Ferry Castleman’s, Snicker's Gap. Sources: National Park Service; Official Records of the Union and Confederate Armies; Civil War Trust (civilwar.org); Patchan, Scott C. Shenandoah Summer: The 1864 Valley Campaign. University of Nebraska Press; Lincoln, Ne. 2007; Salmon, John S., The Official Virginia Civil War Battlefield Guide, Stackpole Books, 2001.